Week 3 of the NFL season was one of the most backward weeks I’ve seen in a very long time (just ask my 1-4 record from last week’s article). Multiple upsets, unexpected success, teams heading back to the drawing board, and heartbreaking injuries that seem to have taken some potential contenders out of the mix for good; and it’s only going to get a lot more interesting moving forward. With that being said, here are my week 4 picks of the NFL season. Are the Miami Dolphins for real in 2018? Is the New England Patriots’ dynasty over? The way I see it, a 1-2 start wasn’t exactly out of the cards for a Patriots team. While I didn’t expect them to lose the way they did Sunday night in Detroit, they were facing the man who knew Bill Belichick inside and out in Matt Patricia. 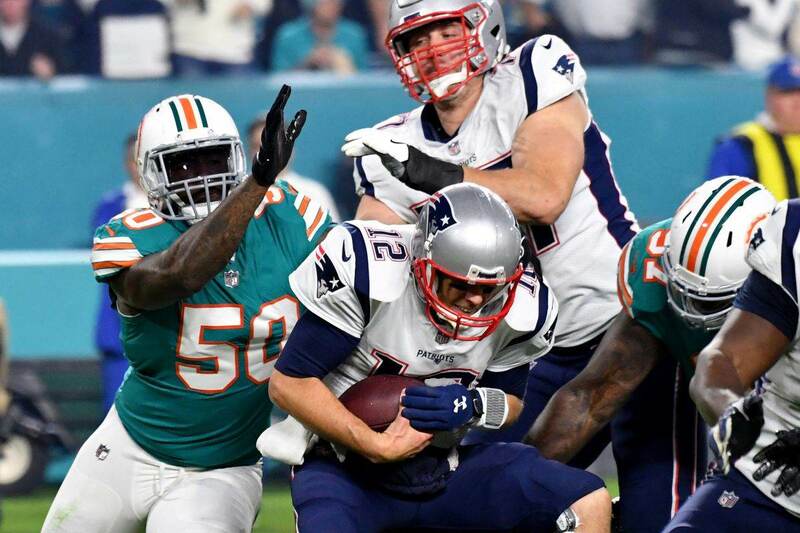 The Patriots have a struggling defense that can’t seem to stop anybody, they are without potentially the two guys that can turn this around (Julian Edelman and Josh Gordon), which makes it easy to plan against New England; and the offensive line has not given Tom Brady enough opportunities to make plays. Also keep in mind that all these loses took place at home, but a limited receiving core made it very easy for the Lions and Jacksonville Jaguars to game plan for the Patriots, and I expect the Dolphins will have the same luck. Ryan Tannehill has been incredible for the Dolphins. He has driven the team to a well deserved 3-0 record and they are looking for their first 4-0 start in 21 years. This game will be close, I think Brady and the offense will struggle early, but I’m giving the edge to the Patriots. With this game being at home, I expect we’ll get a taste of what “4th quarter Brady” has to offer. He drives the Pats down the field late, makes heroes out of Chris Hogan, Rob Gronkowski, and many others for a close victory. The way I see it, this is MUST WIN for New England. Yes it’s only week 4 and it is MUST WIN. When the Pats have their backs against the wall, they get it done, and they will again Sunday. Last Thursday, the Bud Light coolers were unlocked, Cleveland shut down, and the city never stopped partying, because THE CLEVELAND BROWNS WON A FOOTBALL GAME! It’s almost laughable to think about, but at the same time, with everything this team has been through, they deserved that win last week and the city deserved to celebrate. However, they weren’t just celebrating the win, they were also celebrating the arrival of their franchise quarterback. The era of Baker Mayfield is officially underway, and if you thought his performance last Thursday night was impressive, he’s just getting started. Mayfield will be tested in not only his first start, but on the road in the Black Hole in Oakland. It’s going to be a different environment for Mayfield, and something he will need to adjust to on the fly. He performs well with the likes of Jarvis Landry who is due for a monster game. The offensive line gives Mayfield time to throw the ball and make plays, and I think the Browns defense is legit and will come up with some big plays. The one thing I noticed about the Browns last week, when Mayfield came in that game the tide changed. They were playing for him, and they would win for him. Expect the same on Sunday, because the Raiders he’s facing are nothing more than a shell of their former selves. The Raiders have been one of the biggest embarrassments in the league this year and not because they are 0-3 at this point (as I expected), but they had an opportunity to win all three of those games and they blew it late with terrible play calling and horrible defensive play. The Raiders have been outscored 64-16 in their first three games during the second half as they have been unable to put these close games away. That’s what happens when you trade the team’s best defensive player. I think the Browns make a huge statement in the Black Hole this week and embarrass the pathetic Raiders. The first three games have been the biggest low point in recent memory for the Raiders, but they’ll hit rock bottom on Sunday. In one of the most fierce rivalries in NFL history, it couldn’t be more of must-win game for the Pittsburgh Steelers on Sunday night. However, there is one thing that is for sure, these teams know each other too well for one team to dominate the other. Their last meeting was Week 12 of last season when the Steelers survived a 39-38 shootout against their division rival. The Steelers have had a miserable start to their season and the way I see it, if the Tampa Bay Buccaneers didn’t punt on 4th down on their last drive Monday night, the Steelers might not have survived that comeback. Despite their win on Monday, there isn’t one thing that makes me comfortable picking the Steelers on Sunday night. Their defense has to be at an all-time worst giving up 90 points in their first three games, the team still looks completely unfocused, the offense is inconsistent, and it seems that Mike Tomlin has lost the locker room. The Ravens are coming off a big win against the Denver Broncos and they have had a strong and healthy offseason as well as beginning of the season while the Steelers have looked like they are in complete shambles with no light at the end of the tunnel. The Ravens are also known for playing the Steelers tough and always keeping it close and I expect more of the same Sunday night. I think when all is said and done, Joe Flacco takes it to the Steelers’ secondary and makes enough plays to win the game late, officially putting Tomlin on the hot seat. The rise of Patrick Mahomes has the entire world paying attention. In Mahomes’ first three games as the starter, he has thrown 13 touchdown passes, which is now the most of all time in a QB’s first three games (the second being Peyton Manning with 12). He has found a way to get this entire offense involved in the fun, and he has taken full command of this team. Overall, Mahomes has been so much fun to watch and I believe Monday night will be no different. However, with that being said, the Chiefs defense has to play better. They almost allowed the 49ers to crawl back down when they were down 38-7 last week, and they have given up 92 points in the first three games of the season. Going into a city that favors the home team both physically and mentally, because of the thin air, expect the Chiefs defense to struggle in this one as well. While Von Miller and that Broncos defense still has a lot left in the tank, I expect Mahomes to be able to make plays when it counts, run out of the pocket to escape pressure, make good throws on the run, and do whatever it takes to get the Chiefs a win on Monday night. I do expect Case Keenum to make this a closer game against a struggling Chiefs defense, but the Chiefs have been unstoppable on offense and I expect that to continue on Monday night. DO YOU AGREE WITH MY WEEK 4 PICKS? Let me know in the comments below and by following me on Twitter @SMMcChesney, and follow all my NFL posts and articles all season long.